In 2009, Hong Kong celebrated its long-announced "century of cinema". And why not? For a half century it ranked with the US, India and Japan as one of the world's leading film centers, while folk tales enshrined a "roast duck" comedy as its earliest fiction film from 1909. Alas, hard evidence, not a folk tale, reveals that "roast duck" ran a poor fourth in a Hong Kong cinema beginning in 1914. Nonetheless, that year, a Ukrainian named Benjamin Brodsky produced the territory's first home-grown documentary and fiction films. Brodsky is thus important to China as the Western uncle of its cinema and creator of its most extraordinary film document, A Trip through China (HK, 1916). We recently talked to his son, Ronald Borden, to learn that Cecil B. DeMille, the man who twice filmed The Ten Commandments (US, 1923, 1956), was a family friend eager to film Brodsky's life. We have read God's Country, the unpublished autobiography by Benjamin Borden (Brodsky's later legal name), and have evidence from the 1910s, cementing his reputation as the "Chinese film king" who launched Hong Kong cinema, locally and internationally, throughout 1914-1917. He was a man ahead of his time. From his birth in Odessa in the 1870s to his death in Los Angeles in 1960, the cinema occupied a short but important phase of Brodsky's life. He had even been a circus performer in New York, adept at horse-riding and stunt-cycling (as Ronald Borden witnessed), able to stare down an angry lion while purging it with castor oil. Legend says he first came to East Asia circa 1902, was an interpreter during the Russo-Japanese war of 1904-1905, narrowly escaped death from San Francisco's most infamous earthquake (1906), and mastered four Chinese dialects. From as early as 1909 as a movie exhibitor in China, he learned what bored or pleased Chinese audiences, paid decoys to attract real customers and (again) flirted with death when one of his reels showing cowboy baddies so panicked one crowd that they burned down his theater! Brodsky's love affair with Hong Kong begins four years later, in mid-1913, well after establishing Asian branches of his distribution and exhibition company, Variety Film Exchange. On July 12, he swapped anecdotes with the world-famous lecturer and filmmaker, Elias Burton Holmes (1870-1958), a fellow passenger aboard the ship, Shinyo Maru, bound for San Francisco. Holmes, who disembarked at Shanghai, effectively inspired Brodsky into moviemaking himself. In September 1913, Brodsky revisited New York where he hired Roland Van Velzer, an unemployed actor with camera and laboratory experience, to transform Variety's Kowloon branch into a production studio at 34 Nathan Road. Brodsky arrived back in Hong Kong in mid-December when, as the San Francisco Chronicle (January 6, 1914) observed, "(Variety) the largest company now operating in Japan, China and other countries of the Far East (is) perfecting plans to release special films of its own manufacture depicting life in the Orient." According to his own testimony in The Moving Picture World (New York, 25 July, 1914), Van Velzer spent months generating Hong Kong's first home-grown fiction films from the new studio, using well-educated Chinese actors from Hong Kong Island's "Mirror" drama club. The studio initially produced news and human-interest films that, with hindsight, were a film school for these actors, some destined for recognition as motion picture pioneers of both Hong Kong and Shanghai. On 26 February 1914, Brodsky previewed those films to unanimous praise from the Hong Kong press, especially over The Sport of Kings, a first film record of the annual horse racing carnival in Happy Valley. Variety, said China Mail (February 27), intended "'doing' the whole of China, and for a start a Chinese drama with native actors will shortly be taken". He produced a film of Mirror's stage play, Chuang Tsi Tests His Wife, by guaranteeing funding, production and essential equipment in return for Mirror's talent, costumes and script. As The Defamation of Choung Chow, it became the definitive first "Hong Kong movie", quickly followed (per Van Velzer) by The Haunted Pot, The Sanpan Man's Dream and (fourthly) The Trip of the Roast Duck, each an immediate success with local audiences. Therein lies Brodsky's inestimable film legacy: mentoring Hong Kong 's earliest filmmakers (with credit too to Van Velzer) whether in news stories or drama. 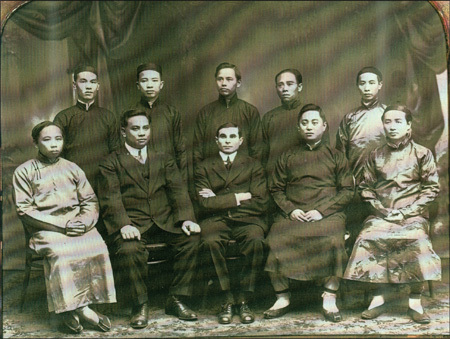 The Lai brothers - Man-wai (ultimately recognized as the "father of Hong Kong cinema"), Buk-hoi and Hoi-san - lived that legacy by establishing Hong Kong's "China Sun" film company in 1923 to similarly make newsreels and drama. The legacy significantly affects Shanghai too. Fittingly, for a Year of the Tiger, sightings of a wild tiger roaming Hong Kong Island was 1914's biggest news story. Brodsky thus commissioned a "Peak tiger" film comedy, with the Hong Kong Telegraph (April 4) even asking readers to submit ideas to the studio, which remained intermittently newsworthy until mid-June. In November, Brodsky and nine Chinese partners registered China Cinema Company Limited, HK's first film production company, superseding "Variety". Their first film, the Brodsky-directed A Trip Through China (HK, 1916), principally photographed over a two-year period, triumphed sensationally across the US from October 1916. China's government under Yuan Shih-kai visibly sponsored that film in which Yuan's three sons appear, allowing the first-ever filming of interiors and treasures within the previously off-limits Forbidden City. According to Ronald Borden, the government also furnished a special train for the film crew. Brodsky's "pull" in official China had its drawbacks however - too many banquets! - so, conscious of his weight, he hired a proxy to eat on his behalf! The official involvement offered powerful promotional "grabs" for the film's two-year tour of America. Trip survives and, today, its measured, near-mystical pacing allows time to fully savor its settings. An especially cruel scene features a slow-strangulation execution while the victim's vital organs are "primed" for immediate re-use. Trip employed a presenter-lecturer and musicians (often Chinese), enjoying added runs in many American churches, surely bolstering support for Brodsky's quest to build a vigorous China-wide cinema with Chinese-American capital. He even proposed making a movie spectacular entitled The Empress Dowers, a ten-reeler, like D. W. Griffith's Birth of a Nation (US, 1915), that would similarly dramatize the "birth" of modern China. By mid 1917 the dream had collapsed. Yuan's death in 1916 and the impending chaos of China's chaotic "warlord" decade (1917-1927) scared off investment. Brodsky's new ventures then took him to Japan, back to the US and finally to industrial gambles other than cinema though equally dramatic. Benjamin Brodsky, like DeMille, is legendary, but we are thrilled more by his emergence, from as late as last year, as a real figure, making his proven achievements the more remarkable. A standout figure in the history of Hong Kong, China, he will deserve much attention during Hong Kong's authentic cinema centennial of 2014.